Fine Gael command the support of 35% of voters in 2011’s first poll, with Labour on 21% and Sinn Féin tied with Fianna Fáil. Fine Gael deputy leader Dr James Reilly, and leader Enda Kenny: the party's result in the Red C poll is its best for ten months. FINE GAEL’S lead over Labour in the public opinion polls has extended in the first opinion poll of 2011, with Enda Kenny’s party now able to count on the support of 35% of voters ahead of the spring General Election. The latest poll, commissioned by Paddy Power and carried out by Red C, show FG a full 14 points ahead of Labour, carrying the support of 35% of voters compared to Labour’s 21%. Fine Gael’s performance is the highest recorded since March of last year, when they recorded a similar performance in a Sunday Business Post poll. Sinn Féin’s prominence in opinion polls has continued, too, with the party now tied with Fianna Fáil in third place; each party can count on the support of 14% of voters. The Green Party’s support has returned to 4%, while independent and other candidates account for the remaining 12% of support. Compared to the last poll of 2010 – also carried out by Red C, on behalf of the Sunday Business Post – Fine Gael’s support has upped by 1%, while Labour’s has fallen by 2%. Sinn Féin support has remained unchanged, while Fianna Fáil’s share of the vote is down by 3% – putting the party just 1% ahead of its lowest ever opinion poll showing, recorded in another Red C poll for the Irish Sun on December 3. The Greens’ share of the vote has doubled from 2% last time out, while the independent portion has grown by the same 2% mark. Eamon Gilmore remains the most popular potential Taoiseach, however, with 36% of voters saying they would prefer him to lead the country, compared to Enda Kenny’s 27%. Brian Cowen scored 10% support, one point ahead of Gerry Adams on 9%. Strikingly, however, when asked who they would prefer to have as finance minister following the election, Brian Lenihan remains the most popular option: scoring 19% of support, he is ahead of Michael Noonan, who has 16% of support. Even former Fine Gael finance spokesman, Richard Bruton, outscores Noonan, on 18%. Joan Burton is the preferred option of 9%. The poll sampled 1,000 adults by telephone between Tuesday and Thursday of this week. Full details of the polling data can be found at Politics.ie. 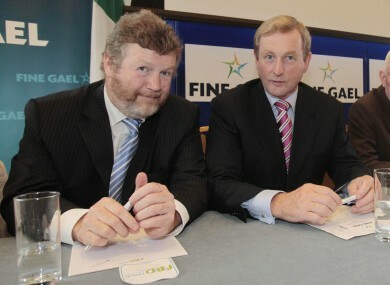 Email “Fine Gael record 14-point lead in 2011's first poll”. Feedback on “Fine Gael record 14-point lead in 2011's first poll”.